This bike’s turn in was not sluggish at all and it loved to carve on faster more twisty trails. Editor’s Note: Mtbr welcomes longtime forum member Kent Robertson to the front page. Kent — or KRob — has been riding and evaluating bikes for two decades. 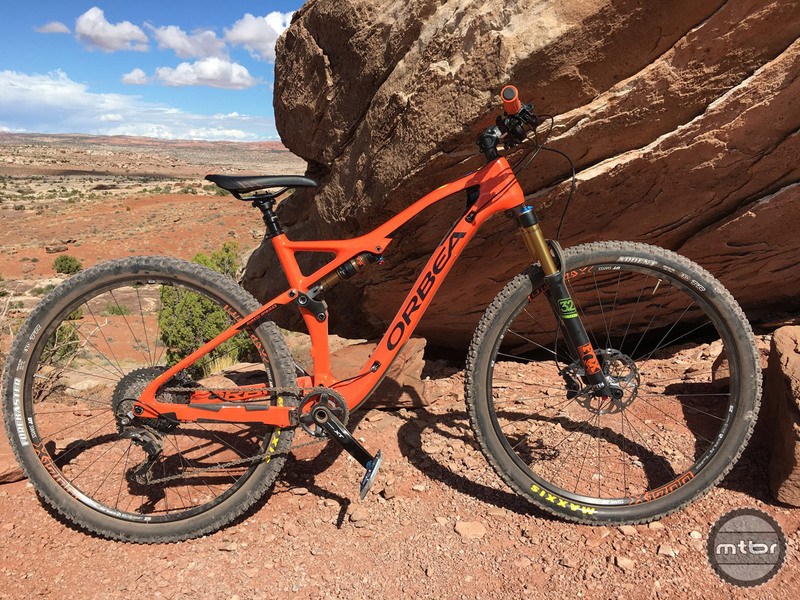 This year, he and testing partner Ben Slabaugh headed to Moab, Utah, for the annual Outerbike consumer demo event where they rode as many bikes as possible. These posts are first ride impressions only — not full reviews. However, they stand by their opinions, and feel like they are good at feeling out the true identity, strengths, weaknesses, and soul of any given bike. For each session, they attempted to get set-up and suspension as dialed as possible. Test rides usually last 30-60 minutes. All bikes are then rated on a scale of 1-5 for visual impression/looks, climbing ability, descending, cornering, general agility, fit, and an intangible factor. Lowest possible score is 7. Highest is 35. Check out the entire Outerbike Test Sessions archive and see all of Kent’s First Ride Reviews. The linkage activated cleaves driven Fox Evol shock worked well on this bike and was tucked out of the way nicely. The Rallon, Orbea‘s 160mm travel 27.5 enduro bike, was actually on my list to test. But after riding three big bikes in a row I decided that a short-travel trail bike would be much more fun on the more XC-oriented Bar M Trails. The tech at the Orbea tent recommended the 120mm travel Occam. Honestly, I didn’t know much about the Occam and I wasn’t expecting much from this 29er. But it did meet the criteria and looked sweet all dressed up in orange and dangled with some fairly spicy components. Venerable Shimano XT brakes and drivetrain did the heavy, while DT Swiss X1700 Spline aluminum wheels spun free and displayed little flex. Sharp lines, 148mm boost rear spacing, internal cable routing, and press fit bottom bracket rounded out the frame details. Never been to Outerbike? Find out what this consumer demo event is all about. This cockpit was a bit dated XC, but the bike still impressed. I was immediately (and pleasantly) surprised by the Occam. The size large’s fit was spot on and pedal input was crisp yet still felt active enough to keep the rear wheel tracking the ground on bumpier terrain. The linkage activated single pivot with Fox Float Evol were well mated for the travel type and leverage ratio. The rear shock mounts high up parallel to the top tube leaving plenty of room for a water bottle (or two). The bar-stem combo was a year or two too narrow and long, but it didn’t adversely affect handling once I re-adapted. 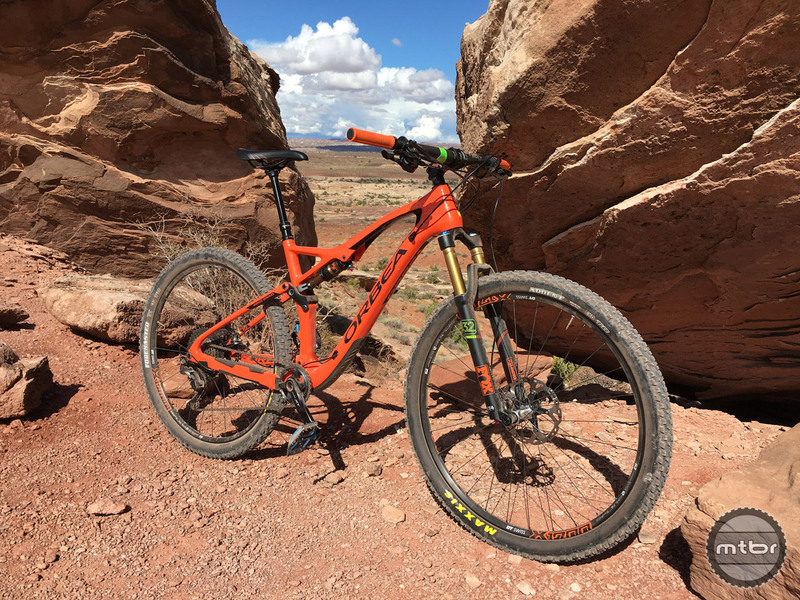 For more information, read the Mtbr First Ride Review of the Orbea Occam. Turn in was not sluggish at all and it loved to carve the faster more twisty North Forty trail. 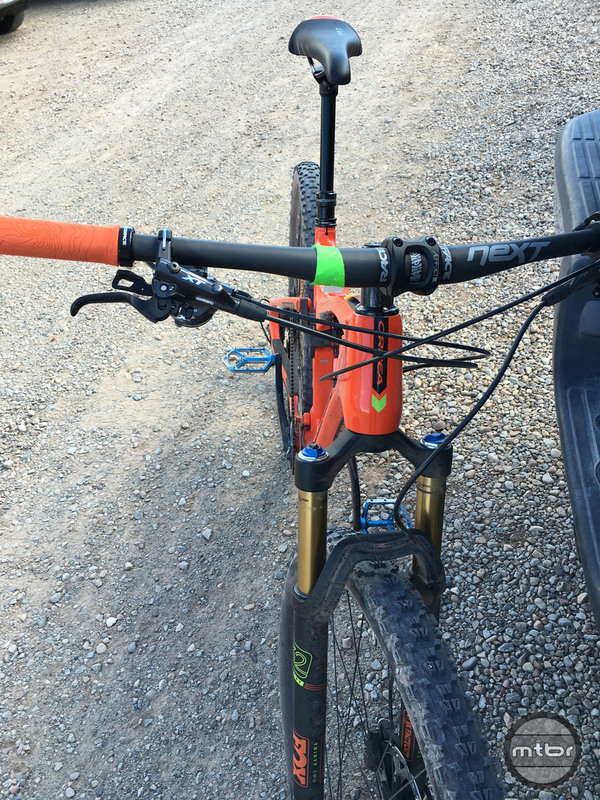 The 17.1″ chainstays kept things tight and responsive without giving up much in the way of straight line stability. The big wheels made it easy to keep momentum up. The Ardent front tire rolled well but isn’t my favorite for cornering grip. The new Forecaster rear tire by Maxxis did not distinguish itself in any bad ways. In fact, I didn’t notice anything about it all, which is usually a good thing. Also of note for being much better than most folks give it credit for was the Fox 32 Factory fork. 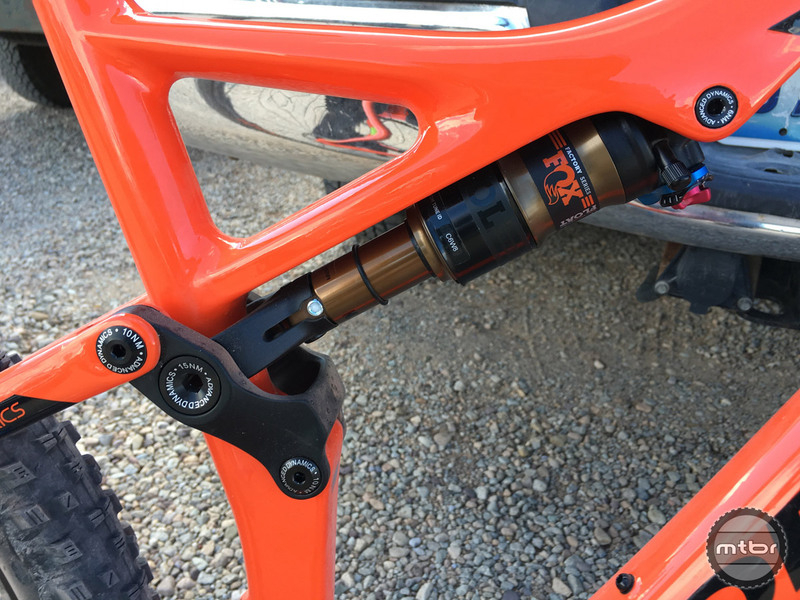 If you start pushing into the more rowdy side of trail riding you may want to upgrade to the Fox 34, RockShox Pike, or MRP Stage. But it felt controlled, accurate, and plush on the small stuff during my ride. Spec included venerable Shimano XT brakes and drivetrain, and DT Swiss X1700 Spline aluminum wheels. Overall the Occam was high on my list of favorite bikes I rode this year. It was a bar, stem, and front tire away from being in my top two or three. So just because you may not be as familiar with this Spanish manufacturer, you should still give Orbea a look. I think you’ll be pleasantly surprised as I was. For more information visit www.orbea.com. 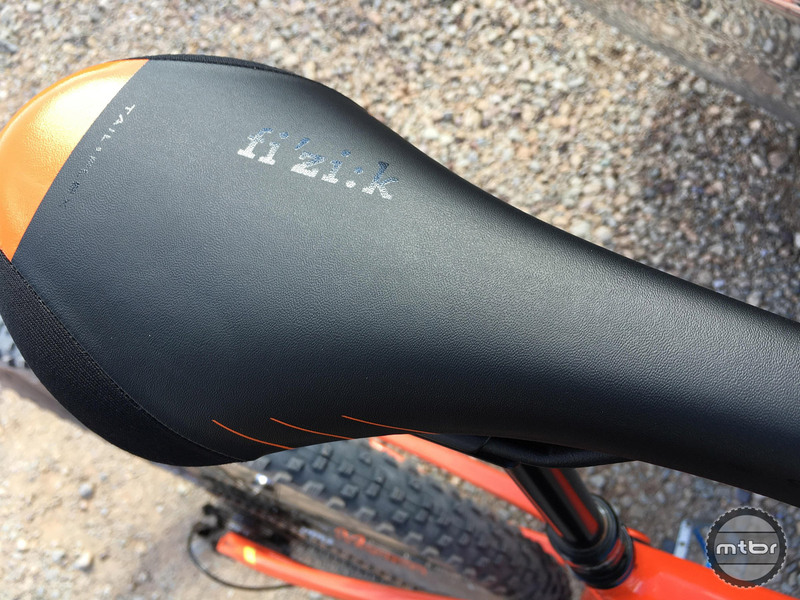 This Fizik saddle matched the orange and black kit nicely, but was a little too rounded on the top for our tester’s backside. Thanks for stopping by, Kent! And thanks for the feedback on the rig, I am glad you liked it. As an owner of this bike for the past 10 months I can say that this has been my favorite trail bike to date. I have mine set up with a Fox 34 FIT4 130mm 29r fork and it’s much better than the recommended 120mm. It’s pretty much an Ibis Ripley LS clone now. Does the similiarity to the Ripley also apply to the pedalling efficiency? I’m a fan of DW-Link and CVA suspension. It’s very close. It’s a small bit stiffer off of the top of it’s shock stroke but doesn’t flex when turning hard.